If you can't cooperate, you'll destroy the world. 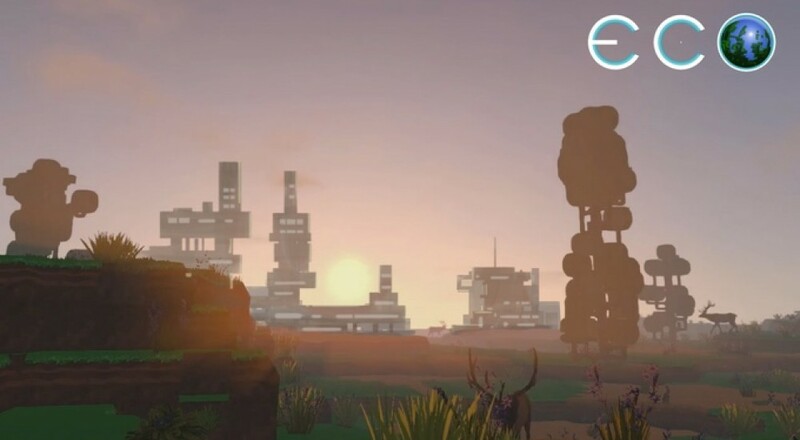 Eco bills itself as a global survival game, and it takes that label very seriously. Traditionally speaking, it could be called a sandbox survival game with elements of realism tacked on. When we say "realism", we're not talking about realistic jump heights or anything like that. Eco's world is run in a realistic way, making resources hard to get and even harder to get sustainably. A typical game in Eco works something like this: a new server is started, and players are dropped in at the beginnings of civilization. You need to make tools, get food, build shelter, that sort of thing, preferably as a group with your fellow eco-vilians (that made-up word sounded better in my head). Some sort of world-destroying catastrophe looms in the future, so you need to build civilization to survive the meteor/earthquake/robot apocalypse. You eventually reach the point where players run in-game shops, set up their own businesses, perform experiments to research technology, and even propose and vote on laws that affix physical limitations on the world, such as having a tree-felling quota for everyone on the server. The resource ecosystem is one of the most interesting things about Eco. If you chop down a tree, a new one doesn't pop up in its place. If you kill all of the spotted deer, more don't spawn over the horizon. You can irreversibly use up all of a particular resource on your server, causing an effective end of game. Server-wide permadeath brought about by the players. Everyone lives or dies based on their ability to cooperate. Better hope the griefers took a day off. Eco is a pretty interesting idea, and so far it doesn't look like it's making its environmental message anything more than a grand gameplay feature. The game has been greenlit on Steam and soared past 50% of its funding goal on Kickstarter within the first week, so it looks like this second world of sorts will see the light of day. Page created in 0.7864 seconds.